Accompanied by his brother, a young man embarks on a quest to find his biological father. 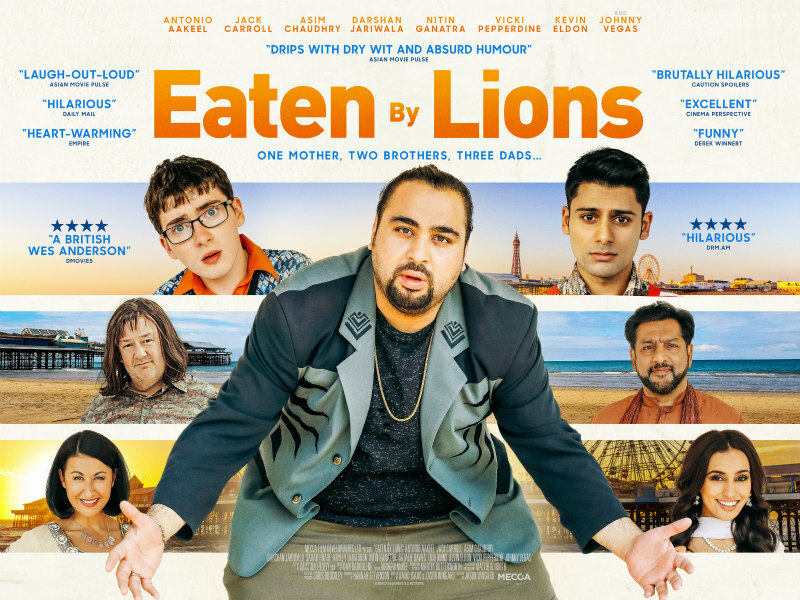 Eaten by Lions begins in Bradford, when multiracial half-brothers Pete (Britain’s Got Talent runner-up Jack Carroll) and Omar (Antonio Aakeel), intend to go on a search for Omar's biological father after their parents are eaten by lions as a result of a hot-air balloon crash, a story so outrageous it covers the front page of the Sunday Sport. They’re also subject to the loss of their beloved grandma Edith, giving them further incentive to take this journey, which Omar says will be difficult. Pete asks why would it be difficult, "Are we going to India?" Omar says, "Nah... Blackpool." "Blackpool?! How's that difficult, it's only down the motorway!" The boys are transported across the M62, arriving at the seaside town with little guidance on where to go next. Their self-direction leads them to a hilariously inept fortune teller (Tom Binns), one whose incompetence is overwhelmingly obvious to everyone except our protagonists, whose empty heads are conveniently accommodated by 'movie logic' as opposed to general logic, so they continue to participate in his claptrap until he concludes, "You will find your father Malik Chaudhry... if you keep moving." They heed his advice and keep moving - in the shape of the Big Wheel. By the end of this round trip, the fortune teller has completed his 'research' and hands the boys a letter saying they can find Mr Chaudhry at this particular address. The siblings are sorry for doubting him, to which he shrugs his shoulders and states that he found the address by Googling "Malik Chaudhry Blackpool." I guess our boys are more witless than we thought. The boys meet a lass called Amy (Sarah Hoare) who, by any predictable narrative progression, will soon be romantically linked with Omar. Amy takes the boys to the house of her paunchy uncle Ray (played by Johnny Vegas with a shaggy Anna Wintour wig on, looking exactly as tragic as that sounds). Ray offers to house them for the night. They don’t know that his contract comes with a clause stating he will repeatedly insult them and intensely interrogate them to know if they’ve deflowered his niece. The next day, they head to their given location and are confronted with a large family headed by Malik Chaudhry in the flesh (Nitin Ganatra). You could cut the tension with a knife. Aakeel lends the film gravitas with a melancholy persisting throughout Omar’s journey - through a compulsory tolerance for the roasters and jokesters along the way, there's a sympathetic character arc that evokes empathy for an individual with an identity crisis. There’s little need to say how he feels about his place between two families as the writers avoid spelling things out, giving Aakeel the opportunity to express his character’s feelings through motion above dialogue. He shares an easy chemistry with Carroll, whose comic background benefit hims in establishing an entertaining balancing act for our central duo. The film may have lost its value without a believable kinship. David Isaac and Jason Wingard's script is heavily reckoned on a brand of northern comedy that loves to poke fun at people's physical appearances - unfavourable comparisons to Ant and Dec, Chuckle brothers, even the hair and costume team have a laugh with their actors - in an amiable way, taking shots at everyone in the diverse cast without lazy stereotypes or undertones of racism as comic fodder. If you're not attuned to the pleasures of Eaten by Lions in the first act, I suggest enduring the film for at least 40 minutes, when third father - possibly the actual father - Irfan enters the scene. Asim Chaudhry delivers a non-stop barrel of hilariously inappropriate jokes as the deadbeat devil-may-care real father. His presence slightly comes at the expense of the cast, because he proves the funniest by far with his impeccable timing and delivery, consequently making each following scene that doesn't feature him less enjoyable as our mourning for his next appearance clouds the moment. 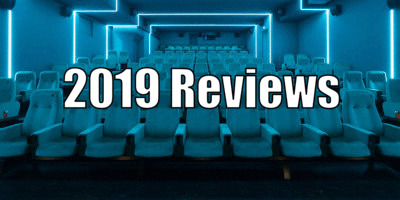 With the end of People Just Do Nothing bookended by scene-stealing performances in Eaten by Lions and Happy New Year, Colin Burstead, here’s hoping the future heralds a cinematic takeover for Chaudhry. 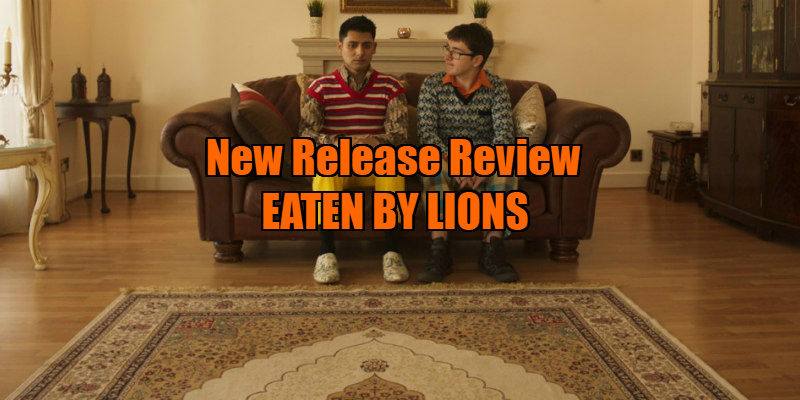 Eaten by Lions is in UK/ROI cinemas March 29th.